Colorado's Maroon Bells are the most photographed peaks in North America. 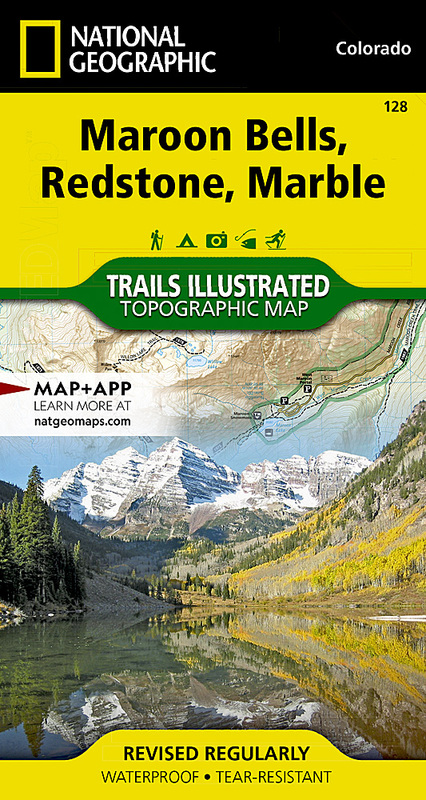 National Geographic's Trails Illustrated map of Maroon Bells, Redstone, Marble offers unparalleled detail for outdoor enthusiasts exploring the aspen forests, clear creeks, high alpine lakes, and towering granite peaks of this magnificent region. Created in partnership with local land management agencies, this expertly researched map features key areas of interest including White River and Gunnison national forests; Raggeds and Maroon Bells � Snowmass wilderness areas; Crystal and Roaring Fork rivers; Conundrum Hot Springs; and Snowmass Ski Area. With miles of mapped trails, this map can guide you off the beaten path and back again. Cyclists will appreciate the detail paid to the many hard surface and mountain bike trails in the region. The West Elk Loop Scenic Byway is noted for those wishing to take in the scenery by car. The map base includes contour lines and elevations for summits, passes and many lakes. Many recreation features are noted, including campgrounds, fishing areas, trailheads, alpine and cross country ski areas, and snowmobile trails. Survival tips and information about wilderness conduct are included as well. Other features found on this map include: Capitol Peak, Elk Mountains, Gunnison National Forest, Maroon Bells-Snowmass Wilderness, Maroon Peak, North Maroon Peak, Pyramid Peak, Raggeds Wilderness, Snowmass Mountain, White River National Forest.